Which spot makes the best dessert hybrid? 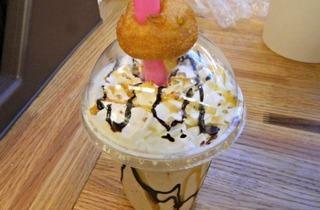 Photograph: Amy CavanaughBeavers Coffee + Donuts makes a doughnut milkshake in five flavors. Photograph: Amy CavanaughFirecakes makes a gelato ice cream sandwich out of its glazed doughnut. 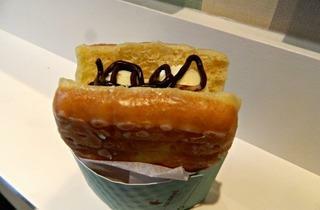 While some Chicago doughnut spots are busy replicating the cronut, others are putting their own spin on the fried treat by adding ice cream. Beavers Coffee + Donuts is whirring doughnuts into a milkshake, while Firecakes is turning its glazed doughnut into an ice cream sandwich. We ate both this morning to determine which dessert was more successful. What’s in it Plain mini-doughnuts, caramel, chocolate, milk and vanilla ice cream. That’s all blended into a shake and poured into a cup lined with more chocolate and caramel, and topped with whipped cream, pecans, yet more chocolate and caramel, and a plain mini-doughnut. There are six flavors, including cinnamon sugar, Reese’s and PB&J. Doughnut or ice cream? 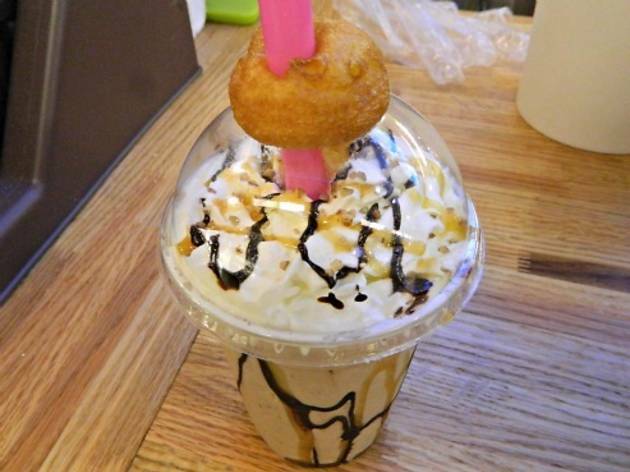 This is definitely an ice cream treat—there are small bits of doughnut in the milkshake, and if it wasn’t topped with a doughnut, you wouldn’t necessarily know it’s a doughnut in there and not cake. How does it taste? It’s not as sweet as we were expecting, but this is still a serious dessert. There’s a lot in there, so it’s heavy and rich. Vanilla is the predominant flavor, which is a surprise given how much chocolate and caramel is used. Mess-factor Unless you like to take the top off and eat the whipped cream with a straw (guilty), this is pretty mess-free. Did we finish it? No. Two thirds were more than enough. What’s in it A glazed doughnut, two scoops of housemade vanilla gelato, fudge. There’s also an espresso gelato available. Doughnut or ice cream? 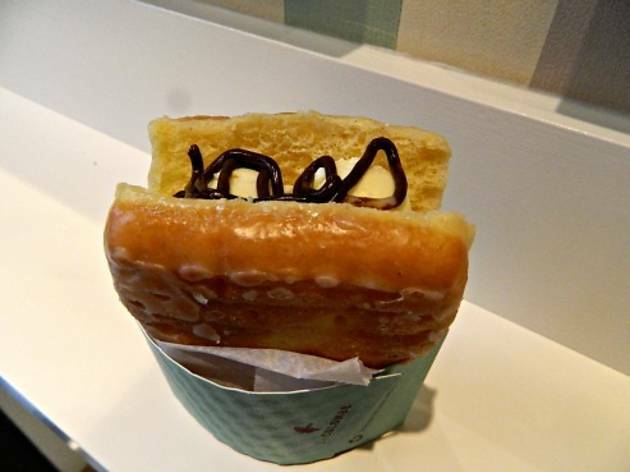 This is a doughnut—the scoops of gelato are kind of small, so there's more doughnut here than ice cream. How does it taste? Delicious. First off, this gelato would be great on its own. And the doughnut has glaze on one side, so it isn’t overly sweet. There’s just a hint of chocolate flavor from the drizzle. Overall, this a very balanced sandwich. Mess-factor The doughnut comes in a paper holder, but to get the last bit of doughnut out, you need to use your hands, so you’ll get a little sticky. Did we finish it? No. Granted, this was our second stop, but it’s still a pretty decadent dessert. The victor Firecakes. We want to go back to try the espresso flavor soon. The ice cream sandwich is available each day starting at noon. Today it was sold out by 2pm, so your best bet is to get it for lunch dessert.